Nodens Ictus are a British electronic music project formed in 1986 as an offshoot of British psychedelic rock band Ozric Tentacles. Nodens Ictus began life in 1986 when Ozric Tentacles guitarist Ed Wynne and keyboardist Joie Hinton were asked by the promoters of the Crypt club in Deptford, South London, to produce an ambient set for the club's "chillout" room. Nodens Ictus explores ethereal, Tangerine Dream-like soundscapes using synths and samples, in contrast to the driving space-rock which characterised the sound of parent band. 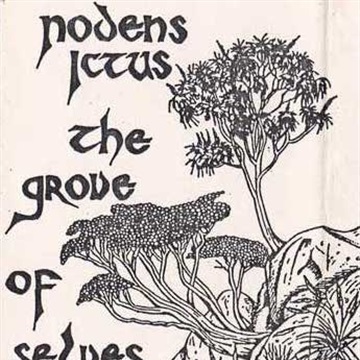 The limited-run, independent cassette-only album The Grove of Selves was issued in 1987 - sold initially at gigs and by mail order, it has subsequently become a rare and sought-after item of Ozric memorabilia. Existing as a side-project only, Nodens Ictus played semi-frequently throughout the late '80s and early '90s, often as a support act at Ozric shows. The band occasionally ventured into electronica/dance territory following the addition of Ozric drummer Merv Pepler to the lineup, until being put on the backburner for nearly a decade as Wynne focused on the increasingly commercially successful Ozrics. Pepler and Hinton meanwhile concentrated on their techno-trance act Eat Static, which had become successful enough in its own right for them to leave the Ozrics permanently in 1994. Nodens Ictus resurfaced in 2000 with the release of Spacelines, a collection of old and new studio tracks along with a handful of live cuts dating back as far as 1988, Released on the Ozrics' own Stretchy Records label, the album generated reasonable interest, and Nodens Ictus soon returned to the live arena, again as an occasional support act at Ozric gigs, most notably at their "Pongmaster's Ball" extravaganzas held in London in 2002, 2004 and 2006, An appearance at the Glastonbury Festival was made in 2003, and Nodens Ictus continued with a pair of small-scale headline shows in Exeter and London in 2005. 2007 saw the band play at the Solfest in Cumbria, alongside Mixmaster Morris and System 7. Nodens Ictus have just announced their first tour in December 2017, featuring Ed Wynne and his son Silas Neptune.